Unlike other seasons where we might be want a more structured hair style, summer is all about casual, carefree hair. Whether it’s beachy waves or sun-kissed highlights, whatever style you wear, these are the products to keep hair in it’s best shape for summer. Summer hair is subjected to many stressors…sun, chlorine, even product buildup. 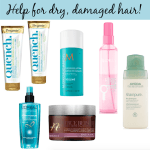 In addition to hydration, products with UV filters and conditioners to help detangle and fight frizz are also essential. 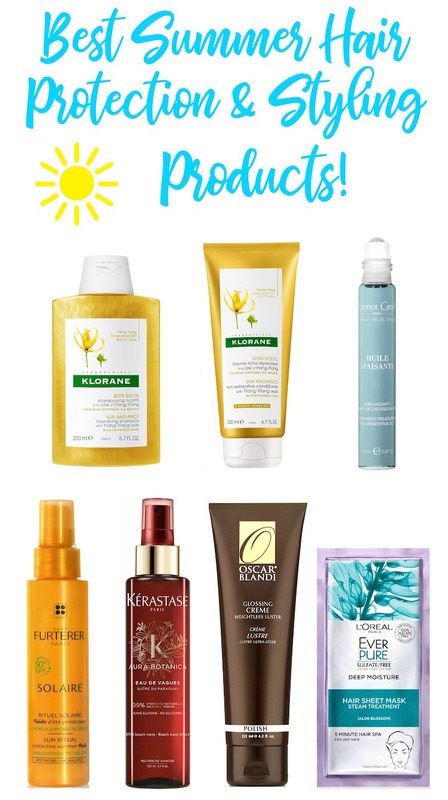 These are the products I’m recommending to keep summer hair looking it’s best! 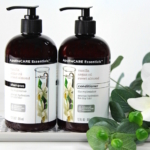 Let’s start with the basics…shampoo and conditioner. Needs are different in the summer, when hair is exposed to sun, salt and the elements. 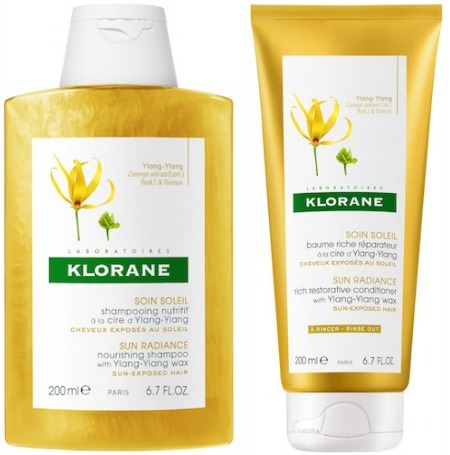 The Klorane Sun Radiance Collection addresses those needs with new Sun Nourishment Sublimating Shampoo with Ylang-Ylang Wax and Sun-Repair Restorative Conditioner with Ylang-Ylang Wax. The shampoo gently cleanses and eliminates buildup of salt, sand, chlorine and sunscreen, leaving hair radiant and nourished. The conditioner repairs and restructures the hair fiber as it protects against the dry, damaging effects of the sun. Hair is left shiny and silky. And the scent? Amazing! Your scalp can benefit from some extra love, too. Leonor Greyl recognizes that stress, pollution, product buildup and poorly rinsed hair (a huge problem) are causing scalp sensitivities. The Huile Apaisante is formulated with 100% natural ingredients (fragrance-free, too), including Copaiba Oil, renowned for it’s anti-inflammatory and anti-bacterial properties and extract of magnolia bark to boost skin’s moisture levels. It’s like a detox for your scalp that you can use occasionally or as a deep treatment. Apply to dry hair before washing or coloring. A must-have! While you could just run around in a hat all summer to protect your hair, that’s not really practical. I work hard to protect my color-treated hair, and sun protection with UV filters is part of the plan. I recently tried Rene Furterer Solaire Protective Summer Fluid (for fine to medium hair types; get the Solaire Protective Summer Oil if you have medium/thick hair) and really like it. Sesame Oil and a chemical filter offers UV protection, and helps prevent your hair from drying out. Oscar Blandi Polish Glossing Crème is the finishing touch you need to deliver weightless shine as it tames frizz, smooths flyaways and protects for heat styling. The Polish Glossing Crème can be used on all hair types, and is especially good for helping to fight against the effects of humidity for lasting frizz protection. You can apply on damp hair, which is how I use it, before heat styling, or directly to dry hair. This formula doesn’t weigh hair down, and has a beautiful jasmine scent. If you’re looking for beachy waves, then Kérastase Paris has you covered with new Aura Botanica Eau de Vagues! I use the Aura Botanica line (review) so I was super excited to see this new addition, which can be used as a blow dry mist and/or beach wave spray for instant texture. I like that this formula uses a combination of Paraguayan sugar, Mexican aloe vera, and other ingredients to coat and hydrate each hair fiber. Aura Botanica Eau de Vagues doesn’t contain salt, alcohol, silicones or parabens in the formula. I’ve been using it on damp hair to add soft waves, and it’s a keeper! I discovered the L’Oreal Paris EverPure Deep Moisture Hair Sheet Mask on a recent ULTA trip, and picked it up on a whim. It’s a sheet mask for hair! You apply it (almost like a turban) to just-washed hair and let it sit for five minutes. It’s suggested to massage it through the cap, then rinse. I made it a point to really rinse this out well, as I assumed it would be pretty concentrated, and didn’t want it to weigh my hair down. Overall, it left my hair shiny and nicely conditioned. I think this would be great for those with long hair; it might be too much for shorter hair types. Do you take steps to protect your hair during the summer? Share in the comments! ‘Do’ Over Time…6 Hair Helpers You Need Now!